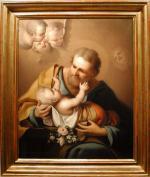 Gorgeous oil painting depicting St.Joseph with little Jesus surrounded by angels was executed in soft romantic colours in ca. 1810/20s. Due to the style, time and manner of painting we attribute the painting to famous Austrian artist Karl Jakob Seybold (1786-1844). He was active in Vienna from 1805 to 1821. K.Seybold is listed in the Austrian Artists Dictionary by Heinrich Fuchs, Vienna 1977. Condition: in very good condition, unlined, professionally cleaned, no paint losses or other damages. The luxurious gold-plated frame is also in good condition.